I suspect that the reason for this disconnect with historical reality is that: 1) The Fox News Channel is essentially a propaganda arm of the neoconservative political cabal that has captured the Republican Party; 2) One of the cornerstones of neocon ideology is Lincoln idolatry and hatred of the South and Southerners. (Professor Paul Gottfried, for one, has written extensively about this.) 3) Therefore, if Glenn wants to keep his gig at Fox, he must toe the party line on Lincoln. Being otherwise libertarian – while the Democrats are in power – serves the purposes of the neocon cabal nicely. Whatever the reason, I am very disappointed in Glenn Beck and have lost a degree of confidence in the accuracy and truthfulness of other statements he has made or will make in the future. I hate this because I have had such confidence in his truthfulness and admire his courage in revealing many of his findings about powerful people and potentially explosive situations. So after Beck hopelessly bungled an explanation of basic early church history, endorsed a view of Washington as an orthodox Christian, and had David Barton as a guest on his show, this guy has JUST NOW “lost a degree of confidence in the accuracy and truthfulness of other statements he has made or will make in the future”? A little slow on the uptake, is he not?
. . . but for some reason I find myself rooting for Beck. Just a little. It reads like a Three Stooges skit. Beck can’t be all bad if he is against this. Why do I think that he will end up simultaneously on two sides, or maybe even three? Dilorenzo’s blood-curdling quotations from Murray Rothbard about crusading Yankee Puritans actually made me laugh. Are we sure it is not a parody? I found it impossible to see LIncoln, Grant or Sherman in his screed, let alone the Union army as a set of John Brown clones. I had no idea there was a connection between neo-cons and Lincoln — they’re so historically narrow-minded that I didn’t think there was much pre-Russian Revolution that they really cared about — and I’m not convinced by diLorenzo (whose grasp of history is no better than Beck’s, in my experience) that the connection is real. I still think Beck’s playing a paleo-con game, not a neo-con one; he’s got much more in common with Pat Buchanan’s historical visions than Bill Kristol’s. Kevin-The DiLorenzo article has so many historical howlers in it, there is neither time nor space to deal with them all, but one particularly caught my attention because of my own heritage: “The Northern war against slavery partook of fanatical millennialist fervor, of a cheerful willingness to uproot institutions, to commit mayhem and mass murder, to plunder and loot and destroy, all in the name of high moral principle and the birth of a perfect world. The Yankee fanatics were veritable Pattersonian humanitarians with the guillotine: the Anabaptists, the Jacobins, the Bolsheviks, of their era.” Anyone who would link the Anabaptists to the Jacobins or the Bolsheviks or anyone who advocated violent resolution of conflict is NUTS!!! (sorry for not using a more scholarly term, but sometimes one must use what best fits the case). I was born and raised Church of the Brethren, although I’m now Unitarian. The COB is an anabaptist denomination, although the title is most often given to the Mennonites. The term anabaptist originated as a slur against those who, beginning in the 16th century, adhered to a religious belief system that rejected infant baptism and practiced the baptism of believers. The anabaptist denominations were also pacifists as a strict religious belief, a belief which they shared with the Quakers (some even became Quakers), and why so many of them fled religious persecution in Europe to the sanctuary of the Quaker William Penn’s colony. While the anabaptist/pacifists were among the first to reject slavery as a religious principle (beginning as early as the 1688 Germantown Declaration http://www.qhpress.org/texts/oldqwhp/as-1688.htm), they also totally rejected violence as a means of achieving any end. Also, DiLorenzo just plain misrepresents the difference between the provisions of the US Constitution on slavery and the provisions of the Confederate. While there was a wide spectrum of opinion on whether the Constitution merely tolerated slavery or affirmatively endorsed it (like Lincoln, I believe it is the former), I know of no doubt that, prior to the ratification of the 13th Amendment in 1865, it was a state’s right to choose or reject slavery within its own borders. Massachusetts had already taken the step before the Constitutional Convention ever met, Pennsylvania had begun the process, and New York was about to, among others. As for the Corwin Amendment, it stated, “No amendment shall be made to the Constitution which will authorize or give to Congress the power to abolish or interfere, within any State, with the domestic institutions thereof, including that of persons held to labor or service by the laws of said State.” Lincoln didn’t oppose it because he felt it simply made explicit the general understanding of the Constitution. Furthermore, the slave states that had not already joined the rebellion ignored it, possibly because the Corwin Amendment only would have limited the federal government. A state still would have been free to end slavery within its own borders. BTW, there was nothing in the Confederate Constitution that provided for the procedure for secession; there were other things that were specified in the Confederate Constitution that had been considered implied in the U.S. and even if it was not deemed necessary to make a right to secede explicit, one would think that, given their recent experience, it would have been deemed prudent to provide a constitutional procedure for a state departing just as there was for the admission of a new state. I don’t know how you do it. I didn’t even bother reading through all of it as I simply have no patience with him. Reading _The Real Lincoln_ was painful enough. Thanks for taking the time to explain just a few of his shortcomings. When DiLorenzo refers to “anabaptists,” he’s referencing the Munster disaster rather than, as you note, the subsequent 4.5 centuries of principled pacifism. But it’s typical of the catastrophic view of history at work here that he fails to credit, or doesn’t know about, the broader tradition. Oh good lord! That’s nice. Defame the mainstream anabaptists throughout history, based on one radical fringe group 4.5 centuries ago. I doubt that many of DiLorenzo’s readers have heard of Munster (other than as a cheese) but the term anabaptist is still in use, especially by Mennonites even though, like Dunker as applied to the COB, it started out as a perjorative term. Thanks for the clarification, Jonathan, but makes DiLorenzo’s misstatements more egregious in their distortions and omissions. I’m not a pacifist myself (probably my dad’s fault for marrying a woman who was the first member of her father’s family born in the U.S. rather than Scotland ; the Scots are competitive with the Zulus and the Ghurkas for being the most warlike ethnic group.) but I respect the courage and integrity it took to stay true to the belief even if it meant imprisonment or even death. Beck’s grasp on history is about as good as you could expect from someone with a high school education and a loose grasp on the facts. His screed attacking Theodore Roosevelt for being a “progressive” demonstrated both his complete failure to understand history in a contemporary setting and was just plain wrong most of the time. 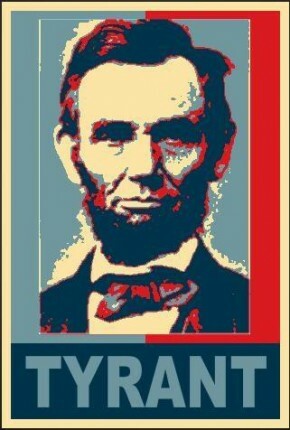 His views on Lincoln are likely a product of his politics, where Lincoln is the revered father of my political party. He overlooks Lincoln’s strong efforts to keep the Union together, like the suspension of habeus corpus – which was necessary at the time – most likely because he isn’t aware of them or, at least, doesn’t understand why they were such tough measures at the time. As for the Fox News conspiracy nonsense – leave the politics to us politicians. Stick to history. Whom do you suggest should “stick to history?” Mr. Levin quoted Mr. DiLorenzo’s article about Mr. Beck. Could you clarify that statement? And, regarding your comment to leave the politics to the politicians: no, thank you. Just as many Southerners did not trust Stephen Douglas in 1860 (and thus splintered the Democratic Party), I do not trust most politicians today. I was responding to the point made about the Fox News conspiracy. As that was a comment made by DiLorenzo in his article, it was aimed at him. You don’t have to trust politicians to keep modern politics out of a history discussion. Beck is not an historian. He uses what he views as historical analogies to make points about present day politics. You aren’t going to gain any insights on the American Civil War listening to anything Beck says. He’s a personality, not a scholar. If you want to talk politics, there are plenty of places to do that. I don’t think this is a good one. I couldn’t agree with you more. Beck is not a historian. His grasp of twentieth-century history makes it next to impossible to understand to understand important moments in American politics as well as the evolution of the two major parties. Beck is a wonderful entertainer, but that’s about it. Since this is a blog about historical memory it’s next to impossible to keep politics completely out. The point of this post was simply to point to the way Lincoln is used in certain political circles.